CAUTION: CONTENTS EXTREMELY HOT! This is the cap of Minor League Baseballs Salem-Keizer Volcanoes the single A short season affiliate of the San Francisco Giants. The Volcanoes play in Keizer, Oregon. Although this team has only been around since 1997, baseball in Oregon is nothing new. There have been teams in this particular region of the country since way back in 1940 at one point or another. The Volcanoes play at Volcanoes Stadium, which is a strictly baseball facility, that seats 4,252 fans. Some former Volcanoes are Twins closer Joe Nathan, Giants first baseman Travis Ishikawa, and Giants pitcher Jonathan Sanchez. The Volcanoes have won 5 league titles and 7 division titles in their 14 year history. 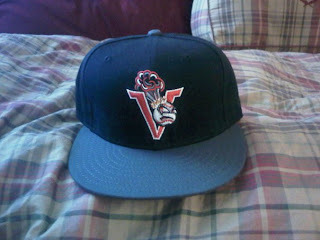 I picked up this fitted at one of my favorite fitted shops, Cap City in West New York, New Jersey. The link is posted below. 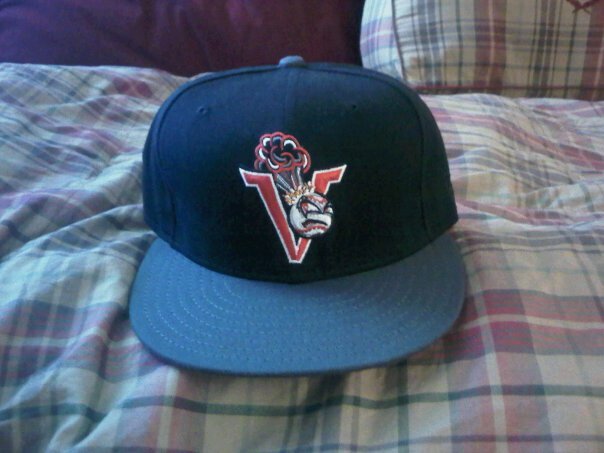 The fitted has a black crown, charcoal gray brim, with a V colored a molten red and a baseball on fire and billowing smoke. The general color scheme is gray, black, red and orange/yellow.